In considering the making of a sculpture, especially if it is a commissioned piece, drawings are made as an initial step. These are accurate, representational portrayals in pencil. 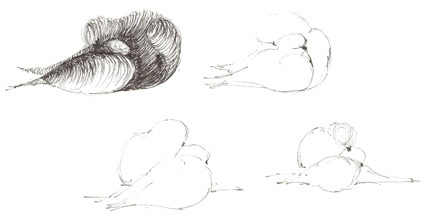 These sketches help to get to know the subject, know it intimately from drawing it, which requires looking closely. This helps with carving, it lends an assurance and confidence in making the shape with the chisel. It is a way of working out the look, rhythm and feel of a sculpture before carving. They progress to freer sketches to promote sculptural ideas and work through the possibilities workable in the stone being used. Throughout the process of carving, the shape is drawn onto the stone over and over as it is repeatedly lost through chiseling. This marking on the stone refines shapes, tests and adjusts lines and meeting points of curves or edges, it is a constant guide.